The next day was a rest day and we enjoyed the nice weather and the view from ABC, did some short walks and just enjoyed the sun. Suddenly, shortly before noon, the earth moved underneath us and all of us felt the “rolling movement” and suddenly our focus was on the mountain nearby. Likely, no rocks came down and all of us were released. We waited outside for a while, but at that time could not feel any aftershock. The night was quite in terms of earth movement and we all tried to sleep. For the Sherpas it was not an easy night because we had no connection the rest of the world and they really started to worry about their families. The next morning, they all tried to contact their families with the few satellite phones Kari had. I spent over an hour with them and was so moved by the different discussions we had, that I could not hold back my tears. One once able to talk to his wife, but had still no news from the children. Another one informed his colleagues that the house was gone and that the family slept in a tent. I was, of course, also very much interested how Lhakpa’s family is doing, since I have spent quite some time with time in the Khumbu a few weeks back. Unfortunately, Lhakpa was not able to reach his family for a long time, and finally, as he was able to reach his wife the news were overwhelming: First the good news: His wife, his mother and the two children are all fine. The terrible news is that all of their houses have been destroyed, at total of four: his old house, his mother’s house, his wife’s sister’s house and Lhakpas new house, less than one year old. He informed me that his wife and his mother are sleeping in a tent nearby the new house, where the kitchen still seems to work. I could not believe what I just learned and could not hold back my tears. In the next few hours I made a decision not to climb Mount Everest anymore, there is too much pain on the side of the Sherpas and why should I block a Sherpa on a mountain for a four weeks or so while his family is suffering and would desperately need his help. I decided leave the mountain, travel to Nepal and help him and his family to rebuild the houses. 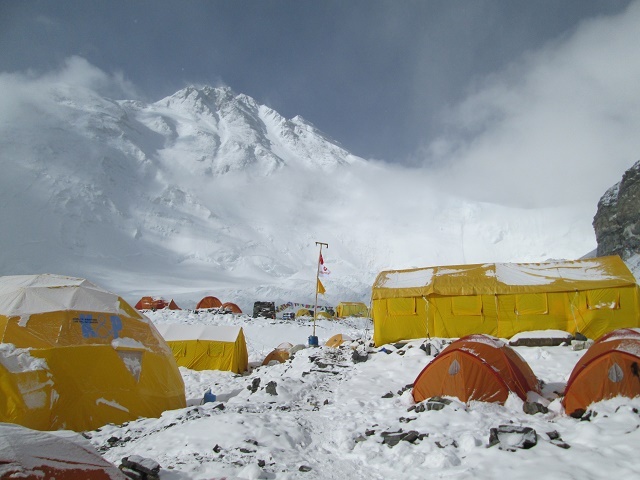 I informed Kari the same evening and the next morning Lhakpa and I, as well as some colleagues and about 90% of the Sherpas left ABC for Base Camp (there is mobile phone connection in base camp, so most Sherpas were no able to contact their families with their own phones). 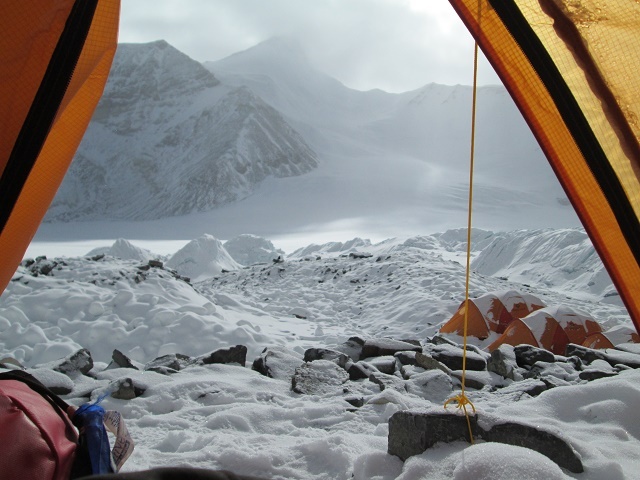 Once we arrived in base camp, it was like entering another world. Only now, we realized what happen in Nepal and many friends and family members tried to contact us to check if we are OK. The earth has been shaking a little bit on the North Side of Everest, but nothing compared to what happened in Nepal. We were shocked! Everything changed from this moment. 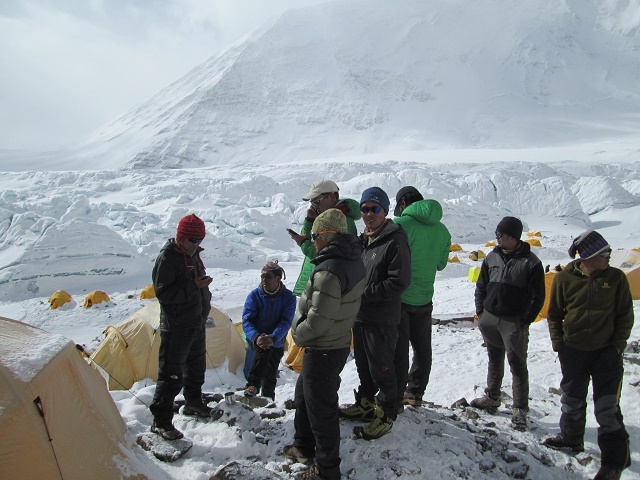 For example, it was not sure if our group could continue the climb and on my side, I had been informed that the road between the Tibetan border and Kathmandu was gone. This is the main road from Tibet to Kathmandu and if this part is closed, then there is only one why out of Tibet, by airplane from Lhasa. The question for me was now how can we get out of Tibet to help Lhakpa’s family? In the next days, many things happened. 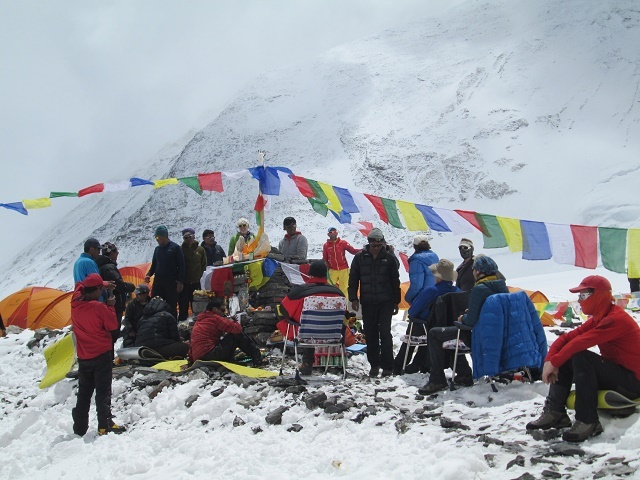 The Chinese authorities visited base camp and informed all expedition groups that the mountain is officially closed because of the earthquake. Now this was another big change for our group. Me, personally, I had made this decision before and I was still trying to figure out how to travel to Lhakpa’s home town, where 30 of the 34 houses have been destroyed since all possible routes are closed. On April 29, Kari made the decision to move out the whole group out of Tibet through Lhasa. Soon after this decision, the members started to change their flights from Lhasa (versus Kathmandu) via some major Chinese cities like Chengdu or Peking. Me too, I made the decision to travel to Lhasa and try to get a flight from there to Kathmandu. From there, Lhakpa and I would try to get a flight to Lukla and then walk up in about two days to his home village where his family is still sleeping in a tent. Once there, I hope that I would be able to help them to rebuild their houses during the next few weeks. My plan has changed from climbing the Top of the World to helping some Sherpa families in the Khumbu rebuilding their houses and I feel very good about it. This is the plan and we will see how things will go. Due to the catastrophic situation in Nepal, I may not have any Internet connection for few weeks. However, I will try to make short updates once in a while.